From the Back Cover&colon; How close did Germany come to winning World War II? Did Hitler throw away victory in Europe after his troops had crushed the Soviet field armies defending Moscow by August 1941? R. H. S. Stolfi offers a dramatic new picture of Hitler's conduct in World War II and a fundamental reinterpretation of the course of the war. Adolf Hitler generally is thought to have been driven by a blitzkrieg mentality in the years 1939 to 1941. In fact, Stolfi argues, he had no such outlook on the war. From the day Britain and France declared war, Hitler reacted with a profoundly conservative cast of mind and pursued a circumscribed strategy, pushing out siege lines set around Germany by the Allies. Interpreting Hitler as a siege Fuhrer explains his apparent aberrations in connection with Dunkirk, his fixation on the seizure of Leningrad, and his fateful decision in the summer of 1941 to deflect Army Group Center into the Ukraine when both Moscow and victory in World War II were within its reach. Unaware of Hitler's siege orientation, the German Army planned blitz campaigns. Through daring operational concepts and bold tactics, the army won victories over several Allied powers in World War II, and these led to the great campaign against the Soviet Union in the summer of 1941. 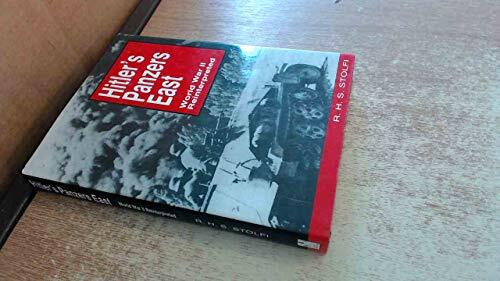 Stolfi postulates that in August 1941, German Army Group Center had the strength both to destroy the Red field armies defending the Soviet capital and to advance to Moscow and beyond. The defeat of the Soviet Union would have assured victory in World War II. Nevertheless, Hitler ordered the army group south to secure the resources of the Ukraine against a potential siege. And a virtually assured German victory slipped away. Thisradical reinterpretation of Hitler and the capabilities of the German Army leads to a reevaluation of World War II, in which the lesson to be learned is not how the Allies won the war, but how close the Germans came to a quick and decisive victory--long before the United States was drawn into the battle. 8. Hitler's Panzers East. World War II Reinterpreted.